Bookstore owner and self-appointed Christmas fairy, Julia Landon is beloved by almost everyone in Harmony Harbor. Full of goodness and light, she's funny, kind, and generous, bringing magical stories to life for the children of the town, watching over the neglected, and acting as the Gallagher family's own personal guardian angel. But Julia is keeping secrets and one of them weighs heavily on her. If it comes to light, it could not only tear apart the happiness she's found among the citizens of Harmony Harbor but ruin her deepening relationship with Aidan Gallagher. Aidan is having troubles of his own. The gruff, cynical former DEA agent is battling his ex-wife over what's best for their young daughter, still grieving over the deaths of his mother and baby sister years ago, and struggling with the deep-seated anger and bitterness he doesn't realize he still has. The last thing he needs is to be sidetracked by Harmony Harbor's very own Christmas elf, yet that's exactly what seems to be happening. Even though he's sure Julia is hiding something, he can't seem to stay away from her. The more time he spends with her, the more she burrows into his heart and softens his edges but when Julia's secret is exposed will Aidan be able to find forgiveness in his heart? I adored this couple. They fill each other's spaces, creating a solid foundation for a lasting love. 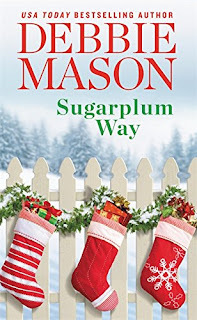 Though the journey to their HEA is filled with twists and turns, I like that Mason injects a healthy dose of humor and light along with the emotional turmoil and dash of danger. As with other stories in this series, I appreciate that Aidan's ex (formerly portrayed as a selfish witch) is more fully explored. With a seven-year-old daughter in the picture, Aidan and Julia cannot exist outside of his former family unit (nor do they want to) and Mason approaches that dynamic with thoughtful, realistic care. I look forward to, hopefully, seeing more of Harper's character evolve in future books. Julia's Texas sheriff father and one of her three protective brothers are introduced in this book. I'm intrigued by both of them and keeping my fingers crossed for more sightings, either in this series or a future one. I've fallen in love with Debbie Mason's Harmony Harbor. She's created a group of interesting, realistic characters and woven them into a perfectly imperfect fabric of life in her small east-coast town. There are secrets, betrayals, loves lost...and won, second chances, intrigue, a matchmaking ghost, a butler who isn't what he seems, wonderfully realistic children who are exactly as they seem, characters filled with kindness and generosity, others filled with pettiness and jealousy, and, finally, deeply emotional love between couples of all ages. As Julia would say, a forever and always love. While each of the books in this series stands on its own, I strongly encourage readers to read the series books in order. There are several characters, relationships, and story threads that continue to evolve throughout the books. Reading them in order will deepen and enrich your understanding and appreciation of these characters and their stories. The books, in order, are: Mistletoe Cottage, Starlight Bridge, Primrose Lane, and Sugarplum Way. Have you read Debbie Mason's books? Do you enjoy books that focus more on emotion than physical love scenes? Do you enjoy ensemble casts in your romances? I enjoy both as well as ensembles and love Debbie's books. On my list. I've been reading her since her debut. I think she gets better and better with each book she writes. I've got this one on pre-order. You recommended Debbie Mason's books to me, PJ, and I'm grateful. I enjoyed her Christmas, Colorado books, but I really fell in love with the Harmony Harbor books. I'll be reading Sugarplum Way next Tuesday. I think you'll like it, Janga! Never read her books. I will have to add her to my author list! She's really good, Amy. Hope you enjoy them! I hope you've enjoyed them as much as I have! I have it on pre-order and can't wait to read it. If you are a fan, sign up for her newsletter. They are hilarious. The back and forth between Nell and Kitty. Yes I have read Debbie's books and love them, I don't focus more on emotions love all kinds of the romances, and yes I love the cats and dogs in books. I believe in Santa love playing the part. I have been collecting the books, but am sadly behind. I definitely need to read the whole series in order. Thanks for the review! I always enjoy her books. Thanks for the review and giveaway chance. I'm almost caught up in this series. I love Debbie Mason's books and I just love this new series. I can't wait to get my hands on this new books. It sounds like there is quite a lot to love in this series, and in this book in particular!